Scissors - for opening cardboard and plastic packages. Pliers - for snipping open plastic ties (I can never get them with scissors). Small screwdriver - for opening those battery compartments on toys. Most require a Philips head but be sure you have a flat head too, just in case. (Mine is reversible so it does both). Camera - be sure it has batteries (or is charged if you use your phone). You don't want to miss a shot! 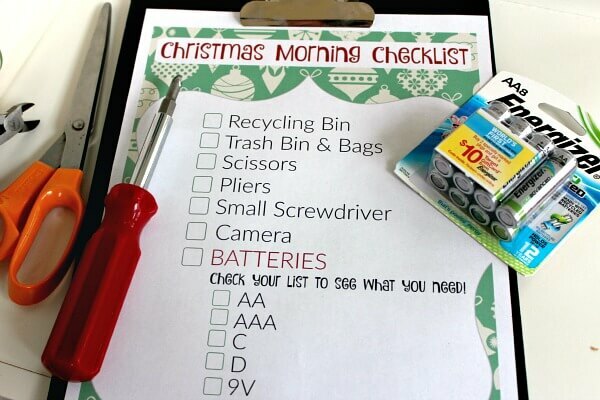 Make sure that you've stocked up on batteries not only for the toys under the tree, but for all your high tech devices (my hubby always gets something that needs batteries too). This year, we're stocking up on Energizer® EcoAdvanced™ batteries - the world's first AA battery made with 4% recycled batteries. I love that we can power our high-tech products with less impact on the planet, and since Energizer® EcoAdvanced™ AA is Energizer's longest lasting battery, it's a win win! 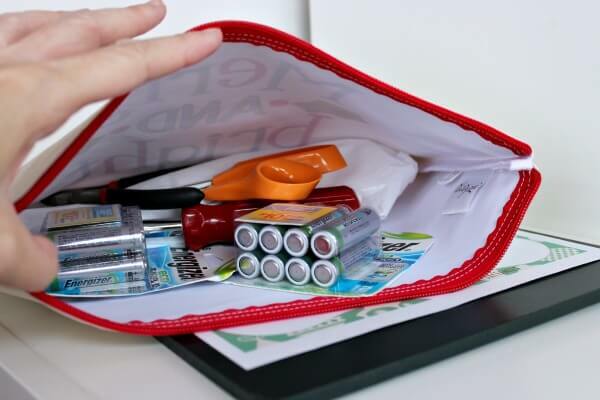 Gather everything up on your checklist to create your survival kit. I put mine in a cute holiday pouch I had but any small bag or basket will do. 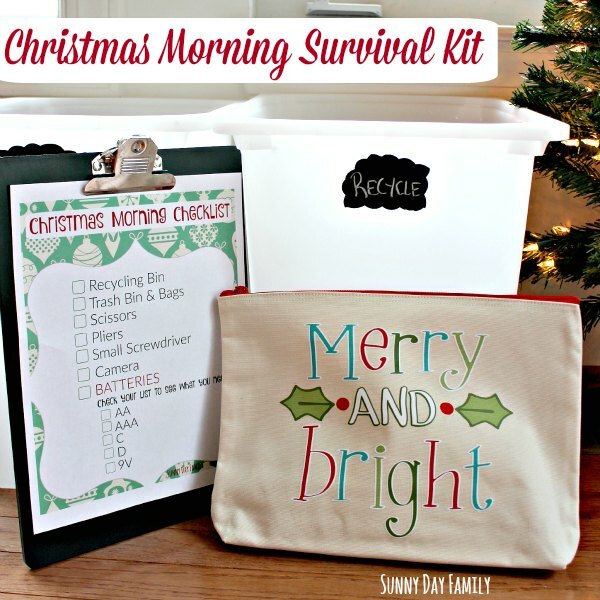 The other key element for your Christmas Morning Survival kit is a place for all the wrapping and packaging that gets strewn around when opening presents. In the spirit of being more eco-friendly, I'm replacing my dad's big garbage bag with a recycling bin. 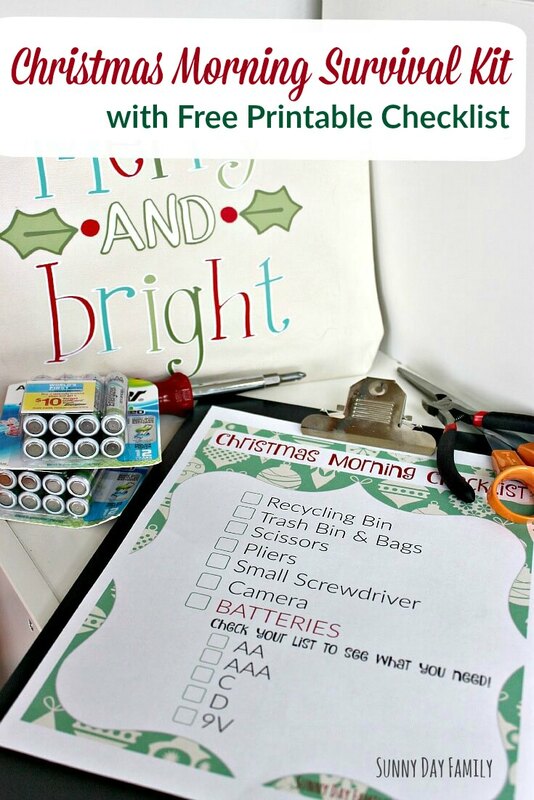 So much of the waste we make on Christmas morning can be recycled, and if you sort it right from the start you'll be much more likely to make sure it gets to the recycling center and not the landfill. I included a trash can as well for the non-recyclables. 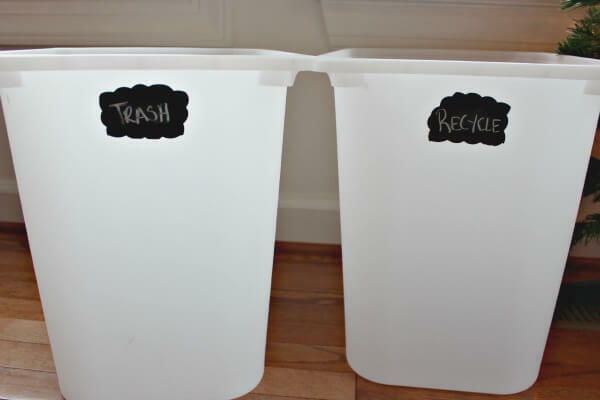 Just take two tall plastic bins, and cut labels out of chalkboard tape so everyone knows which is which. An easy and eco-friendly recycling center ready for the holiday! I'm so excited for Christmas morning with my family, and it will be even more fun for me now that we are stocked up and organized. Be sure to download your checklist and get your kit ready too! I stocked up on everything for my Christmas Morning Survival Kit on my weekly run to Target - find Energizer® batteries right by the checkout! 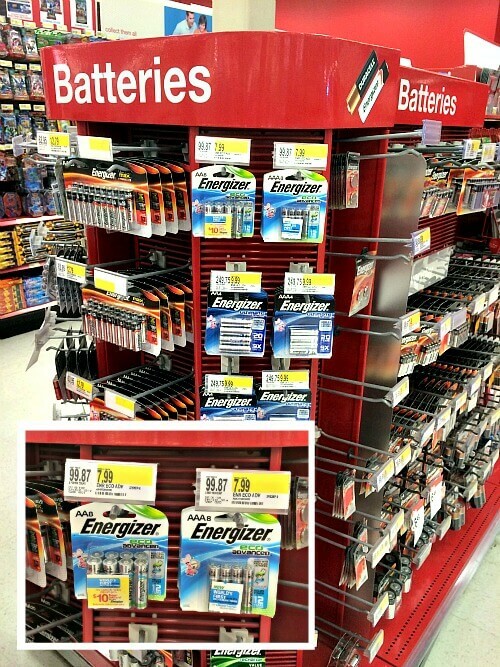 How can Energizer® EcoAdvanced™ batteries power up your holiday? Leave a comment below and let me know!